Developer First Contact Entertainment Inc.
Multiplayer action is still a genre that has yet to be fully explored in the virtual reality space. Sony has tried before with RIGS, but for those that want a more tactical approach to their firefights, not many other options have presented themselves. Modeled loosely upon the successes of Rainbow Six: Siege, First Contact Entertainment have tried to capture the essence of tight corridors and intense gunfights within PlayStation VR in their first title for the platform: Firewall Zero Hour. The crux of Firewall Zero Hour (and rather the only competitive mode available to players at launch) is in the form of Attacking/Defending a laptop objective in the Multiplayer Contracts mode. Two teams of four Operators face off on opposite sides of the battlefield; Attackers must breach the firewall from one of two randomly generated locations and initiate a data transfer on a sensitive laptop while Defenders need to use every tool at their disposal to prevent this from happening. In a similar fashion to Counter-Strike’s infamous de_dust2, attackers only get credit for their win if they can successfully complete the data transfer (just like defusing a planted bomb in CS) as just wiping out the enemy team won’t initiate the win. Defenders can secure a win for themselves just by wiping out the enemy team, but it’s important to lay down fortifications such as Signal Jammers or Door Blockers just in case they can’t finish the job. While Firewall Zero Hour does the Contracts mode incredibly well, that’s the only multiplayer mode that’s available even two weeks after launch. No Team Deathmatch, no King of the Hill, nothing that supports respawns or anything more than the same attack/defend objectives across the nine diverse maps. Expect to have fatigue set in much faster than with any other shooter on the market simply due to lack of diversity in game modes. Even RIGS had a few different play types to help keep players engaged for longer. You’ll often spend about just as much time diving through menus in Firewall Zero Hour than actually playing with how lobbies are currently set up. After every single round (not even a best two-out-of-three variant is available to keep the action going), you’re kicked back into the waiting lobby. If all eight players are queued up, there’s a minute countdown to get your loadouts coordinated, but as soon as a player leaves from either team, you’re stuck waiting for matchmaking to fill that gap. There could have been so many opportunities to find ways to mitigate the downtime, such as a button to ready up or a virtual firing range to try out a new gun before you commit to a potentially regrettable decision. In another glaring oversight by the developers, you’re allowed to swap out Operators but can’t customize their appearances or equip a secondary skill without leaving the lobby and going through the main menu. If players are expected to occupy themselves during that minute countdown, at least give them more options to work with to coordinate their team’s efforts. So much of the gear you’d actually want to use in Firewall Zero Hour is gated behind both a level requirement as well as currency (CryptoCoins, as they’re referred to in the in-game economy). Without the preorder exclusive double XP bonus, it took nearly a week of wins and losses to rank up to level 15, getting access to a couple of additional guns and a few attachments but none of the game-breaking utilities like the signal jammer or proximity mines. As you level up, new operators will become available with a unique primary skill but also room for a purchasable secondary slot. Early on, opting for Texas and her ability to take a little bit extra bullet damage is handy but later on, you’re going to want to go with someone that can track enemy movements or have a better handle on recoil for those sustained firefights. But again, these additional abilities are going to take many matches in order to afford. The few guns I did have access to cost at least $15,000 to unlock, which may not sound like an incredible amount, but to put that value into perspective, a winning match might net a player just under $700 depending on their performance. A new gun winds up running the player about twenty matches worth of effort and it might not even be an upgrade that they desire to keep using. One smart approach that I would like to see included in other shooters with persistent progression is that once a piece of gear is unlocked, such as a laser sight or muzzle brake, it’s unlockable for every single other gun that can utilize the upgrade. If First Contact Entertainment wants to keep their player base engaged, adjusting the economy with either a much higher rate to unlock new guns or reduced prices across the board could be the next best approach to take. Falling into the same trap as other PSVR titles that try to go with a realistic style, Firewall Zero Hour doesn’t quite hold up when the action slows down. Even on the PlayStation 4 Pro, gun models and those of your fellow comrades-in-arms lose their fidelity and wind up being a jagged mess of pixels when the action slows down. Spotting enemies from across the map can also often be difficult to see with the lower resolution of the PlayStation VR, but I fear this will be a common complaint of mine until Sony achieves the next generation of VR headsets and can increase the resolution of their headsets and eliminate that screen door effect. Firewall Zero Hour gives the player something truly special with the gun in their hands. Never before have I played a shooter that gave this amount of freedom with separating the gun from the player’s actual field of vision. No matter which way you’re looking, the gun operates completely independently from both the camera and where the player’s standing. Firewall can allow for unique tactics that you wouldn’t get from any other traditional FPS. Want to blind fire around a corner without sticking your neck out? Just physically point your gun around and unload in that general direction. Hear someone creeping up behind you for a supposedly easy knife kill? Point your shotgun behind you without having to take your eyes off the objective. This unique style of locomotion sets Firewall apart from every other competitive shooter on the market and I would love to see the team either flesh out what they’ve begun with Zero Hour or expand on it in a brand new game that can feature more than just the singular game mode. 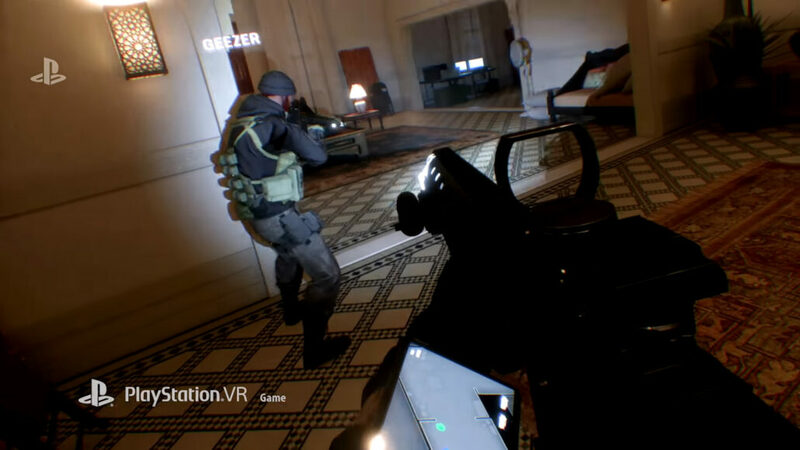 Since the firefights in Firewall Zero Hour are ‘one and done’ without any respawns, downed players usually have to sit out until the next match, but where’s the fun in that when you’ve got a VR headset on? Once you’ve been eliminated from the match, you can still provide tactical support to your teammates by way of static security cameras scattered throughout each map. Voice chat is just as important when you’re alive as when you’re dead, so being able to call out enemy locations is a huge tactical advantage in any situation. I can’t tell you how many times my teams’ collective butts have been saved from a 1v3 situation just by someone providing overwatch support and calling out when enemies are about to pop out of cover. Thanks to having that physical prop of a gun in-game as a point of reference to steady my focus, I found myself being able to enjoy sessions of Firewall Zero Hour longer than most any other competitive title in PSVR. It didn’t matter whether I left the turning control on the pie-sliced rotation or free rotation, either option felt well and didn’t leave my head in a state of disconnection and floatiness. At launch and every other night that I’ve been free to play Firewall: Zero Hour, my sessions can go anywhere from thirty minutes to a few hours without any discomfort or issue, so I certainly can recommend this one as a solid title to showcase the power of virtual reality, especially if you have a PlayStation Aim controller on hand. Nothing short than the best VR adaptation of a tactical team shooter like Rainbow Six Siege, Firewall Zero Hour impresses with what the next generation of tech can do for competitive play. In its current iteration, there’s an incredibly solid framework for gameplay but what surrounds the experience is what will leave players wanting more. No doubt future support in terms of mode diversity and incremental patches could both turn Firewall into the next great multiplayer VR, however, only time will tell. 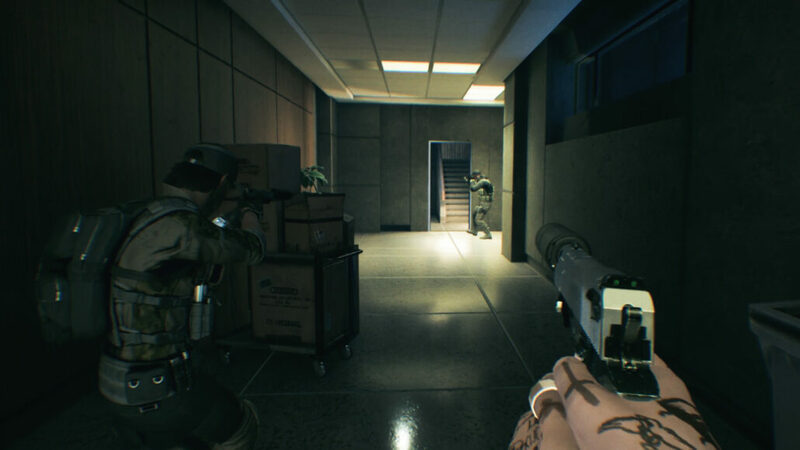 In its current state, Firewall Zero Hour is a shooter best left to smaller bursts. Put your headset on, invite three friends, and grab your Aim controller for some of the best tactical gunplay VR has ever seen. Review code provided by the publisher. You can purchase the game on Amazon, standalone or bundled with the Aim Controller. First Contact Entertainment has shown they know how to make a team-based shooter work in virtual reality, Now, they need to show that Firewall Zero Hour is more than just a proof of concept by adding in more content before the player base dries up.